What have we not done to live forever? Adam Leith Gollner’s new book weaves together religion, science, and mythology in an exploration of the most universal of human obsessions: immortality. 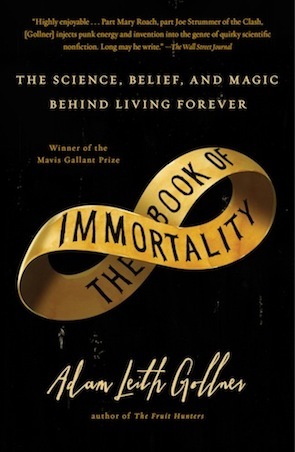 The Book of Immortality explores the myriad ways human lives are shaped by a belief in eternal life, whether it be a Jesuit priest on his deathbed or anti-aging researchers at Harvard or physical immortalists who want to cure death itself. In this riveting narrative, Adam Leith Gollner journeys to David Copperfield’s archipelago in the Bahamas, where the magician claims to have found “a liquid that reverses genes.” He visits a cryonics facility; speaks to cutting-edge biomedical specialists; and attends a costume party set in the year 2068 with a group of radical life-extensionists. He also travels to St. Augustine, Florida, where Ponce de Leon is thought to have sought the fountain of youth. How did longevity science evolve from its alchemical beginnings to modern-day genetic interventions? Interlaced throughout this critically-acclaimed narrative is a meditation on the all-too-human nature of belief. At its core, The Book of Immortality reveals how every story we tell about immortality is a story about the meaning of death.